← M/F/P – Meaning, Form and ? One of the most difficult tasks for teachers is listening to the learners when they are speaking and finding appropriate things to give them feedback on. 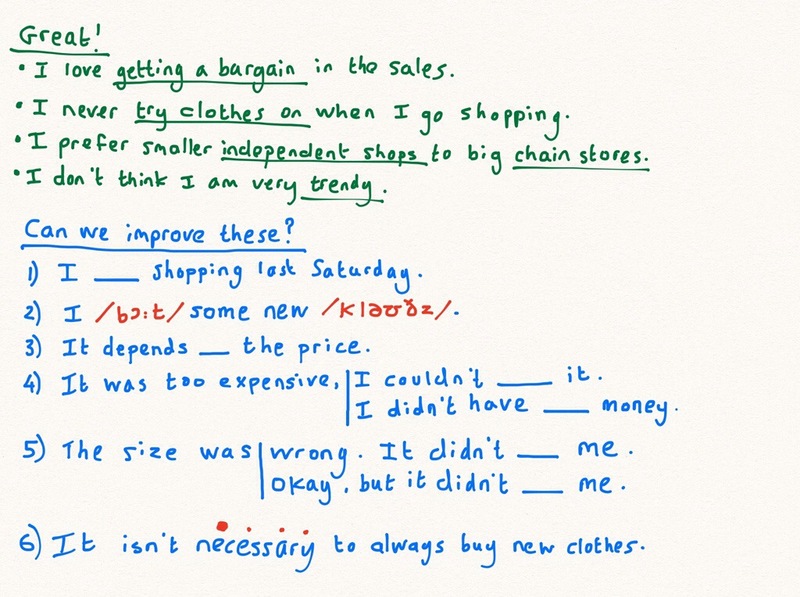 A common approach is to provide a delayed error correction slot when the learners have finished: writing some of the learners’ utterances on the whiteboard and then getting them to try to correct them. Whilst this can be effective, some tweaking can make it even more so. 1. Write the utterances in their context; it can be difficult to correct without this information. 2. Include examples of good language too; this praise can be motivating for the students and can be an opportunity for the students to learn from each other. 3.Think of ways to avoid the dead time involved with writing sentences up on the board. Can you use a tablet or, dare I say it, an OHT/OHP, to write the utterances down whilst the learners are speaking and then project it onto the board? 4. Blanking out the mistake can be effective, it makes learners question their ideas. 5. Listen out for what they are not saying and look for opportunities to upgrade and reformulate their language. 6. Encourage learners to think about how to say the same thing in another way. 7. Plan to get to this feedback stage with enough time to really explore the language and clarify things. 8. Give them feedback on their pronunciation too. Has anyone else got any more tweaks? This entry was posted in Desserts and tagged #eltwhiteboard, EFL, ELT, error correction, feedback, speaking, tweak, upgrading language, using the whiteboard. Bookmark the permalink. Very sensible, down-to-earth suggestions. Will promote it on my facebook page. And here’s the best part: This is coming from someone who has VERY mixed feelings about delayed correction. Thanks for posting this. Thanks for the comments Luiz. Glad it’s got you thinking! Amazing board work – thanks for the ideas and for the inspiration! Regarding #3 – I second avoiding ‘down time’ and using technology if it’s available, I’ve long since stopped using the whiteboard for feedback altogether and instead type gapped sentences in a two-column table (the ‘answer’ goes into the second column). Students get the link to the file (it’s in a shared folder on dropbox), revise and next time get the same table as a mini-test. In short, my main tweak is giving the students a written record of all language feedback. The only (substantial) disadvantage is that it’s difficult to type unless the group are sitting closely together. Thanks for the extra tweak Olyasergeeva, I agree that a written record is important and great to recycle the language in a later lesson. Thank you for this post: I love the idea of delayed correcting and enjoyed reading about the tweaks. I could add using L1 translating as a way to remind students of a/the good way to say something in English. Liked your idea for #3, and would like to use olyasergeeva’s idea about using a shared file. In the past have tried asking one student to be ‘in charge of’ writing new words down, but this is a different idea. Coincidentally, a post on this topic was something I started my own blog with last December! 🙂 Would like to invite you to come and comment. 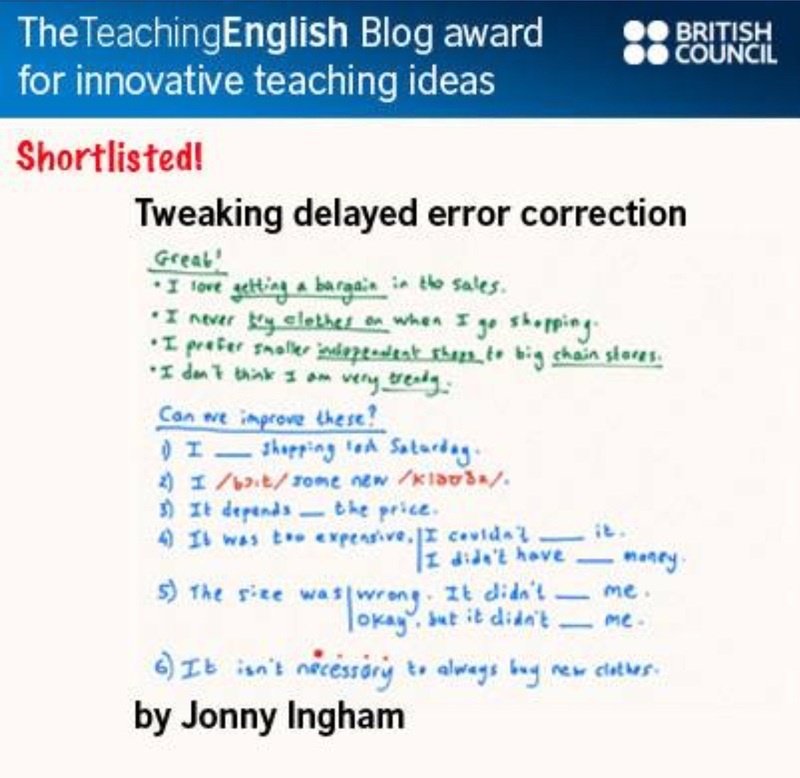 Just to let you know that we’ve shortlisted this blog post for this month’s TeachingEnglish blog award and I’ll be making a post about it on tomorrow’s TeachingEnglish Facebook page http://www.facebook.com/TeachingEnglish.BritishCouncil, if you’d like to check there for likes and comments. Wow, that’s great! Thanks Ann!